My Reflection: Life is about change! Hello again, everyone! Sorry I didn't post anything for a long time. Well, I just finished my holiday. And now I'm back in Singapore for the last semester! Yes, it's the last semester. Finally! Yay! I've been learning a lot about change since I was in high school. First thing you need to know about me: I'm a big hater of change. When change is needed, I always try to resist it, especially when I'm already in the place I want. But, the first thing you need to know about change: it always happens wherever you are. You can't avoid it. In fact, everything changes in time. If I don't want to flow with it, I'll be the only one that remains the same, which means I'll be left alone. 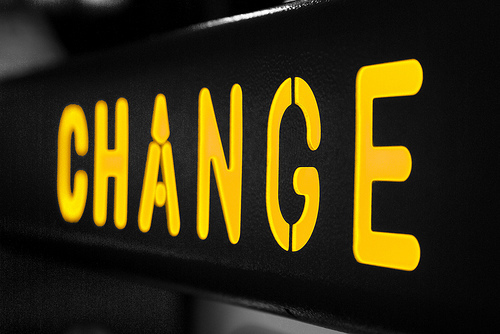 I'm still learning to manage change until now, especially how to accept change when it comes. "Don't resist! Go with it!" That's what I always tell to myself. Because when I resist, I just make my life more complicated. It's like running from problems. Change keeps demanding more, more, and more, while I keep resisting it again, again, and again.When is it going to end, then? The truth is, change is not really that bad. It's good, sometimes it's the only good way you can take. But we fear everything is going to be worse when something is changed. Let go the fear, enjoy your ride with it! Well, we need to adapt change a little bit sometimes. After all, change is about transformation. It's transforming something to something else. The question is, "Do you have the courage to make your journey from here to there?" Everyone wants to go "there", but not everyone is willing to face the journey to go "there". All you really need to do with change is to accept it and enjoy the flow with the change itself. You know you need it, so why resist? Change is for the better. Sometimes you'll get a short-term pain for a change, but it'll give you a long-term gain! At least that's what I learn. But when you don't change, you'll just prepare for a long-term pain. Overall, change is like a bad friend, but actually change is a real friend who wants you to grow better. Be friends with it because you need that kind of thing. It's always better to change your life before your life changes you.